A smallholder farmer plants maize. Photo by CIMMYT/Flickr. European Union leaders have been wrestling in recent weeks with the surge of the “boat people,” tens of thousands of refugees from Africa and the Middle East crossing the Mediterranean in overloaded boats in the hopes of finding a better life. Many of these migrants died during the journey. Refugees like the boat people are fleeing poverty and the loss of their livelihoods in the wake of political instability, conflicts and more deeply rooted issues like land degradation and food insecurity. While media reports have focused on the political crises, rural communities in the drylands of the Sahel, the Horn of Africa and Syria face crop failures linked to declining soil fertility and droughts. As European leaders respond to the refugee crisis, it would be good to consider more than a military crackdown on migrant smugglers, increased surveillance of illegal migrants or allocation of additional resources for resettlement. The situation provides an opportunity to think deeply about what can be done to alleviate underlying, systemic problems of degraded land and food insecurity in the countries of origin. 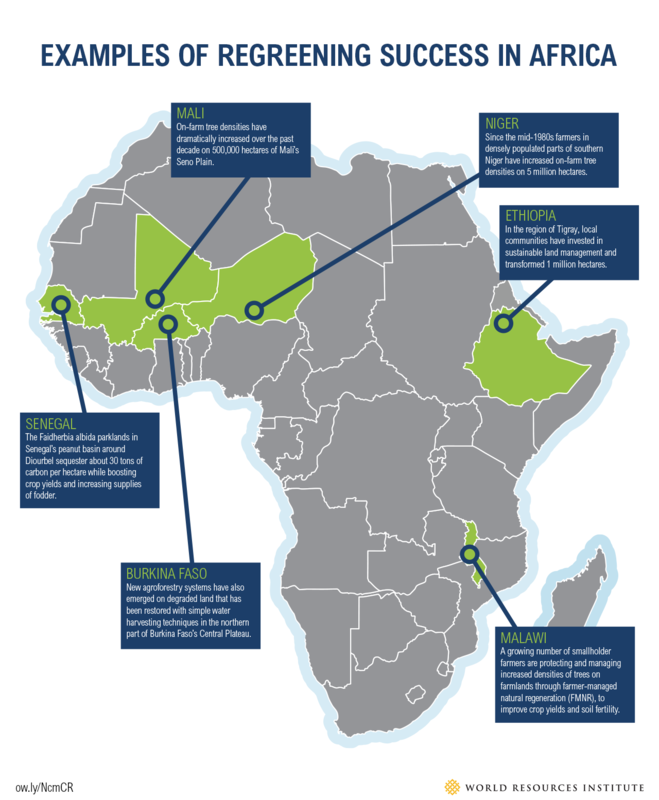 A new WRI report shows that a new “green revolution” in Africa could be a solution. Awareness of the connections between degraded land and food insecurity, livelihood threats and climate change is growing—as is the support for solutions. The global Bonn Challenge aims to bring 150 million hectares (370 million acres) into restoration by 2020. The New York Declaration on Forests, signed in September 2014 during the Climate Summit in New York, pledges to restore 350 million hectares (865 million acres) of degraded forest land by 2030. The recent New Climate Economy report shows that restoring just 150 million hectares of degraded land by 2030 could feed 200 million people, raise $35-40 billion annually in farm incomes, strengthen climate resilience and reduce greenhouse gas emissions. Land degradation and food security challenges are particularly acute in Africa and gaining more attention. Last year, the African Union resolved to accelerate agricultural growth across the continent, reduce poverty by half and end hunger by 2025. National action plans to achieve the related targets of the Africa Alliance for Climate Smart Agriculture are also underway. Donor-funded, government-managed projects to address land degradation can help, but they’re not a panacea. Rather, success can be achieved through grassroots action and improved enabling conditions for the rapid acceleration of restoration at scale across rural landscapes. Such large-scale, transformative restoration is already happening across large areas of Burkina Faso, Ethiopia, Malawi, Niger and other countries. In response to the loss of soil fertility, declining tree densities, and shortages of firewood, fodder and other products, millions of smallholder farmers are protecting and managing on-farm trees as a low-cost way to sustainably increase agricultural production and improve food security, a practice known as “regreening.” A growing body of literature attests to the positive impacts on crop yields and other benefits associated with higher densities of trees on farms and the adoption of improved land and water management practices. In Niger, the increased density of trees on cropland has reduced the time women spend collecting firewood from 2.5 hours each day to an average of half an hour per day. Farmers in Malawi are promoting the growth of Faidherbia albida trees on fields to provide shade canopies and lock nitrogen in the soil. Farmers have seen their maize crop yields increase from fewer than 2 tons per hectare (2.5 acres) to 3 and 4 tons per hectare. In Burkina Faso, farmers are using water-harvesting techniques such as building stone lines and improved planting pits, locally known as zai. These practices help trap rainfall on crop fields, increasing average cereal yields from 400 to 900 kilograms (880-1,984 pounds) per hectare (2.5 acres) or more. These successes can be replicated on a larger scale, but it requires the engagement of governments, farmer associations, community-based organizations, as well as development agencies, the private sector, the media and other stakeholders. 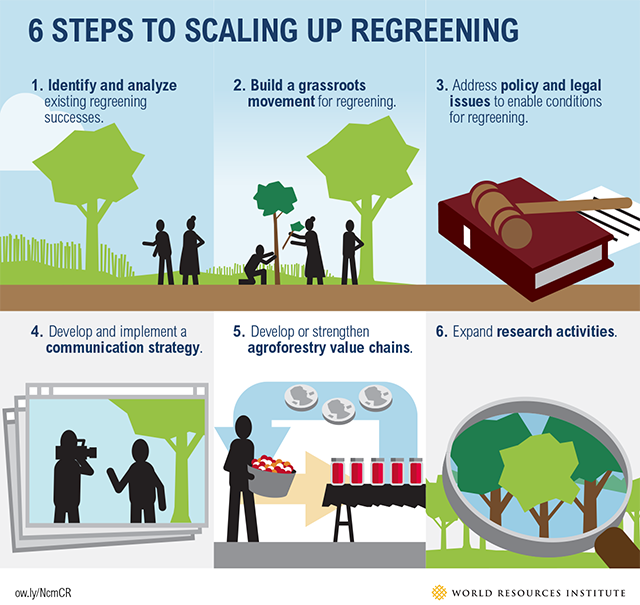 WRI’s new report, Scaling Up Regreening: Six Steps to Success, contains practical guidance and examples of activities in six key areas that are critically important to successfully scaling up forest and landscape restoration. 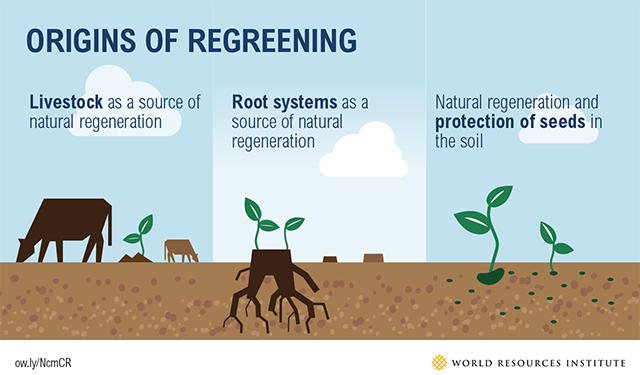 The report lays out a path to facilitate and accelerate the widespread adoption of regreening, agroforestry and other practices that can restore degraded lands and transform rural lives. Farmers have already demonstrated their ability to innovate and adopt practices that restore degraded land and provide a means to secure their futures. The time is now to leverage these positive experiences and invest in effective strategies to scale up restoration. Perhaps then, citizens throughout Africa can prosper in their home countries, eliminating the need to take to the sea to pursue a better quality of life.